The Eassee3D® system is an open system for playback of 3D video on smartphones and tablet computers. We support different apps, edit the videos in side-by-side format for the presentation. In general, the basic versions of the apps are free. For some products, there are fee-based full versions that can do more. We will expand in the next few weeks this area continuously. Unfortunately all Eassee3D® friends had to experience in recent weeks that some of our recommended apps in the meantime refused their service. This was partly due to the changes to the new iOS6 (backward compatibility?) and on the other hand, however, the shifting alliances in the communications world (Apple / Google etc.). We are sorry, but we are afraid that we will continue to have such developments. 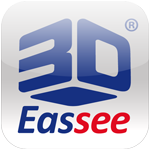 Finally the new Eassee3D® App is available worldwide in the iTunes AppStore. Developed by our German team it offers all 3D friends maximum 3D experience: Just launch app, set up the frame kit right and enjoy 3D movies without glasses. • visit 100,000s Youtube videos and enjoy 3D movies online. The update of the new Eassee3D App version 1.4.3 is reviewed by Apple and now available for download in the iTunes app store. •	With the update YouTube videos are directly playable from the Eassee3D app by online streaming. •	The algorithm of the 2D/3D function has been further optimized. Now you can playback all mp4 files in real time in 3D. •	mp4 videos now can be opened from e-mail attachments. After download of the clips iOS automatically displays a selection function. Eassee3D is also now integrated. Use the 2D/3D generator to playback easy any clips in 3D without glasses. Notice: The patented Parallax-Layer Lenticular Technology works with converted “side-by-side” videos like Sony 3D – Two Worlds – Featuring Leonard Cohen. Make sure, that you always choose the right system to enjoy the full 3D feeling.